September is National Whole Grain Month! Whole grain can have a big impact on the health of kids, and most don’t get enough whole grain in their diet. 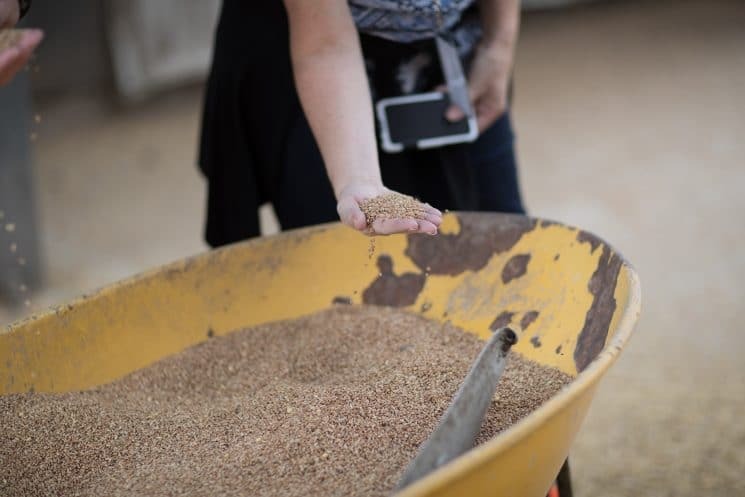 While our kids get plenty of grains in their diet, whole grains are the only way to get the optimal amount of nutrients from their grains! To help my kids understand the difference between whole and refined grains, we had a mini nutrition lesson at home! I had my kids make a 2-columned list of grains they have, and the grains they have not eaten. 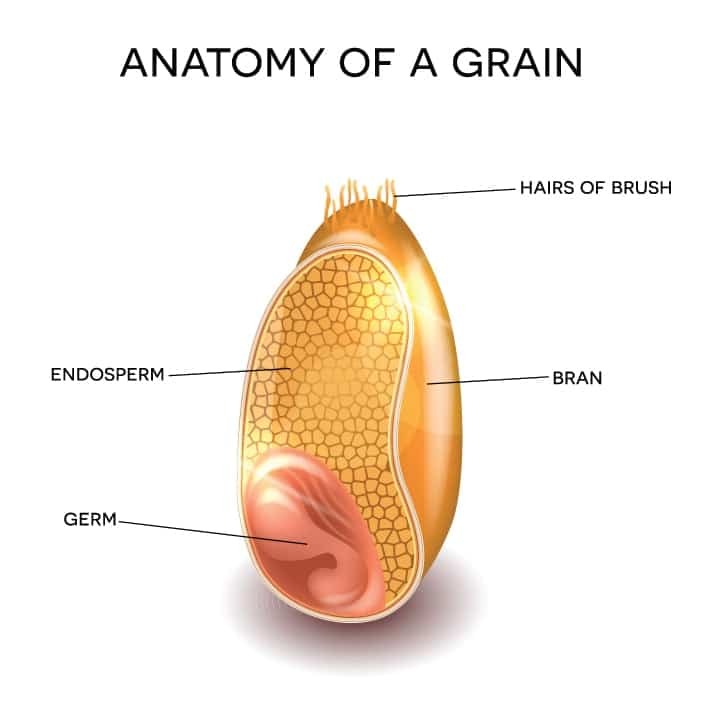 Some common whole grains are: Buckwheat, corn tortillas, couscous, oats, orzo, popcorn, brown rice, rye, quinoa, taco shells, and whole wheat. After the discussion, they circled one of the whole grains they decided was their favorite, and they made a poster advertising the grain and its health benefits. They had to list vitamin, mineral, and fiber content, as well as trying to “sell” the grain as a desirable food to eat on the poster. So, Erica took the challenge. 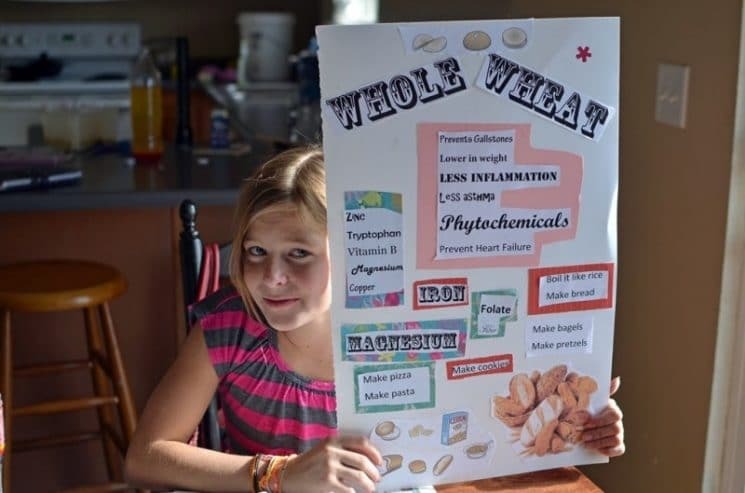 She’s actually tasted all the whole grains, and then made her poster about whole wheat, her favorite grain. She did a little Googling, copied some text about what was in whole wheat, what health benefits there were too eating whole wheat, and what you could do with whole wheat. 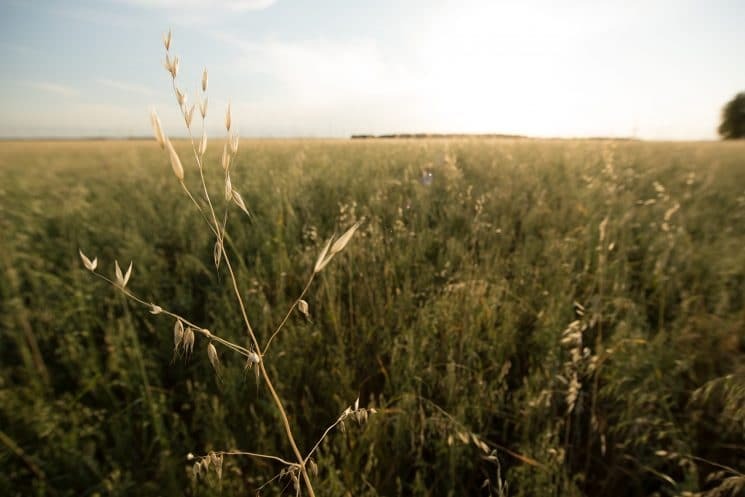 Whole Grain is the first ingredient in all General Mills Big G Cereals, meaning there is more whole grain than any other single ingredient (including sugar from all combined sources). I recently was able to visit one of the farms that General Mills sources their oats from in Winnipeg, Canada. 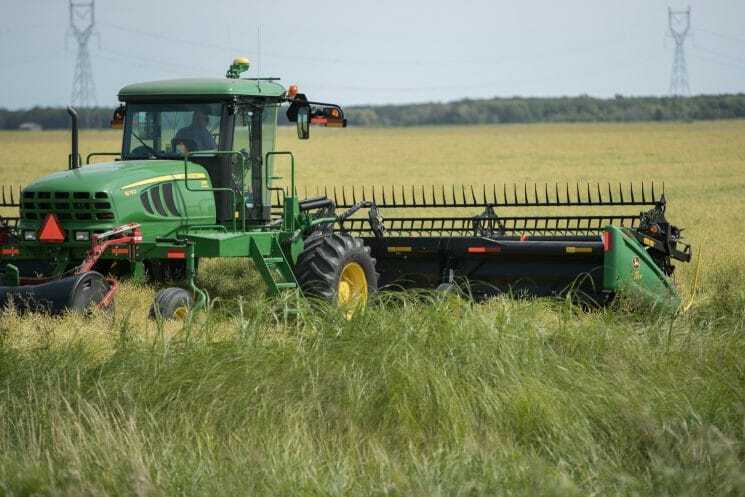 The whole grain oats are harvested and sent to a mill where they are made into Cheerios! It’s amazing to see firsthand how huge these fields of oats were! 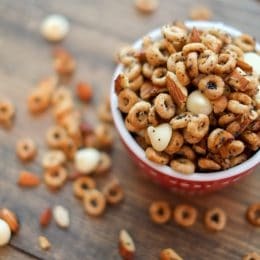 So, with our Whole Grain lesson, we decided to make a snack mix and include Cheerios! Check out our recipe below! 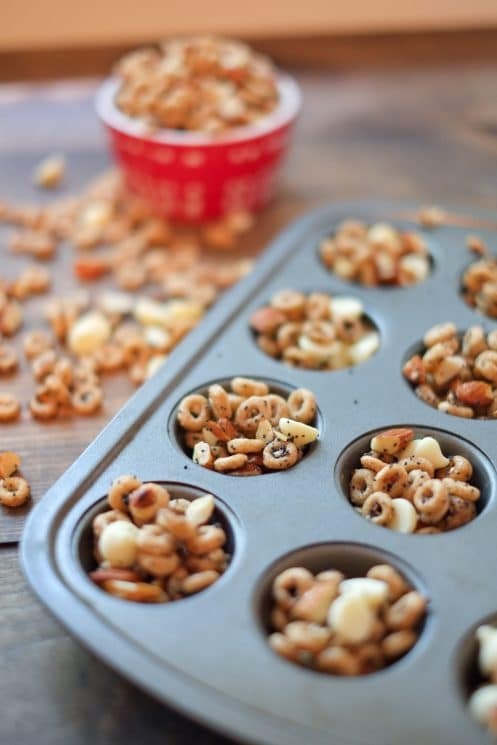 Since Cheerios isn’t a sweet cereal, and we wanted the snack mix sweetened, we used a sweetener to bake onto the snack mix. We used agave because we like the way it bakes up onto this mix, but you could also try honey. We included almonds and poppy seeds, both great sources of healthy fat and fiber! 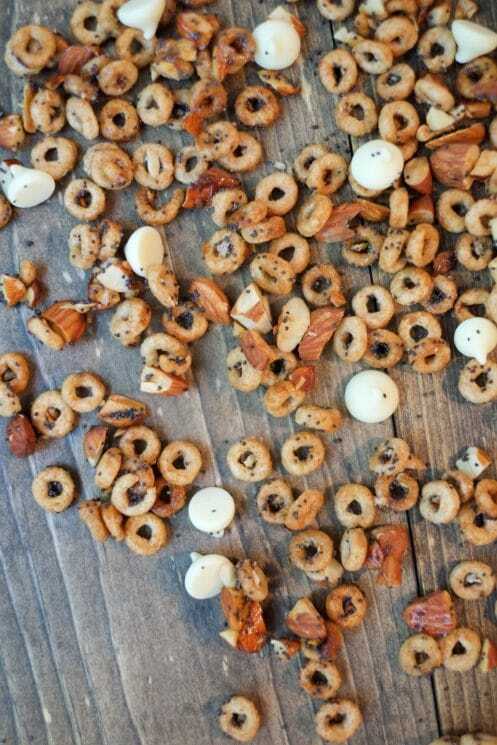 Try some of this snack mix yourself to get your servings of whole grain today! Preheat the oven to 350* F and line a large baking sheet with parchment paper. Roughly chop almonds (you will need approximately 1 cup). 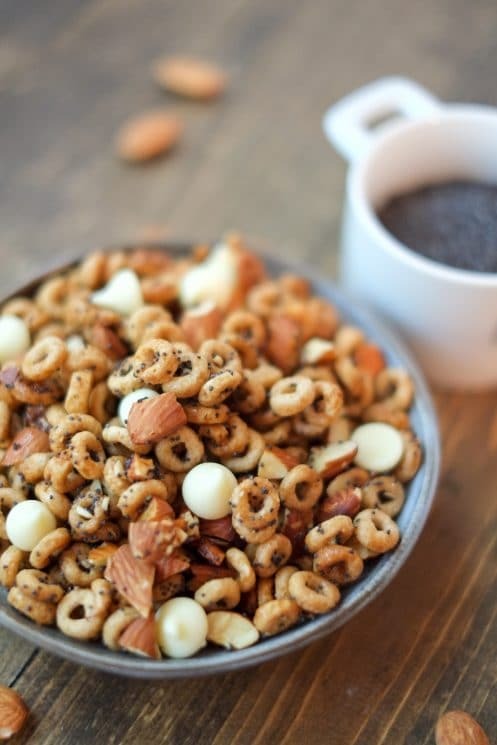 Combine Cheerios and almonds in a medium-sized mixing bowl. Heat agave and coconut oil in a small sauce pan until coconut oil is fully melted. Add a pinch of salt and the almond extract. 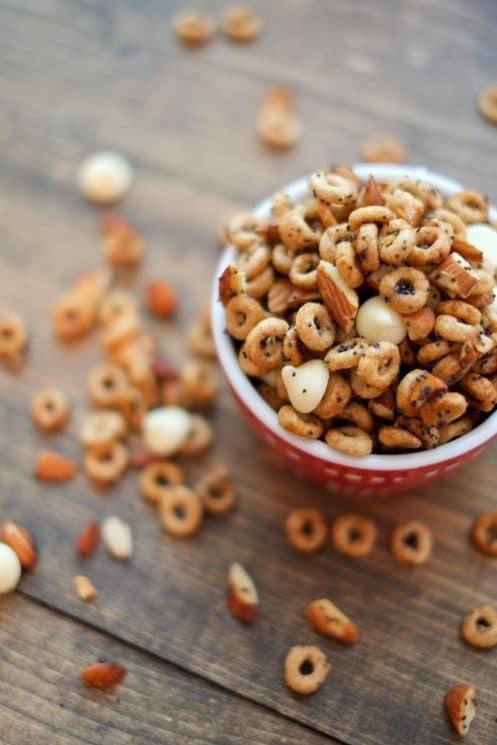 Pour the agave-coconut oil mixture onto the cheerios and almonds and mix well, then mix in the poppy seeds. Spread the mixture evenly on the baking sheet and place in the oven for 8-10 minutes, stirring halfway. Allow to cool completely and then toss with white chocolate chips. Hello….I tried the whole wheat strawberry muffin which turned out great. I substituted honey with maple syrup though. Then I read somewhere that honey should not be given to 12 year olds. My son is 3 years 2 months old. Kids shouldn’t eat honey under 12 months old, rather than 12 years. so you are good!